Thanksgiving Turkey Menu Graphic. Click to view and download the full-size version. 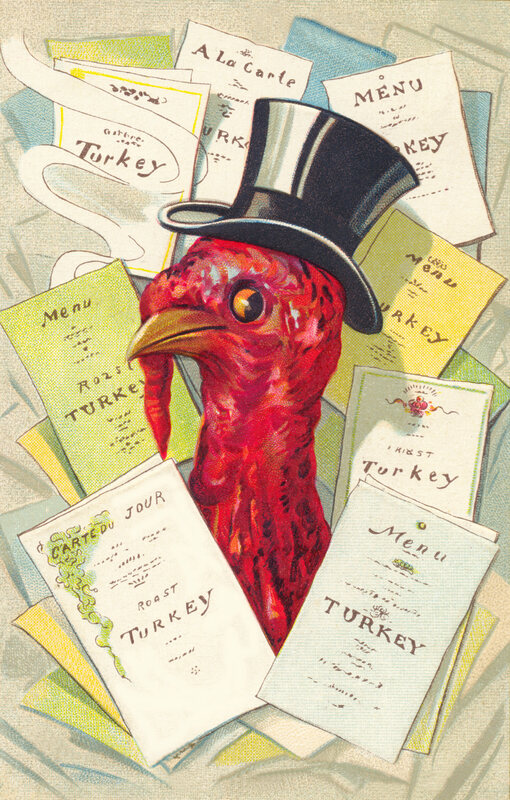 A fabulous Thanksgiving Turkey Menu Graphic from 1909. This vintage turkey has pizazz. He wears a top hat and is surrounded by Thanksgiving menus. This illustration would be great for a Thanksgiving menu, invitation, or numerous other creative projects. As I think this one would be a great print project, I’ve scanned it at 600 DPI. I’ve removed the text and cleaned him up for you. I’ve also removed the cigar that was in his mouth as I don’t wish to promote smoking. I hope you find him useful. 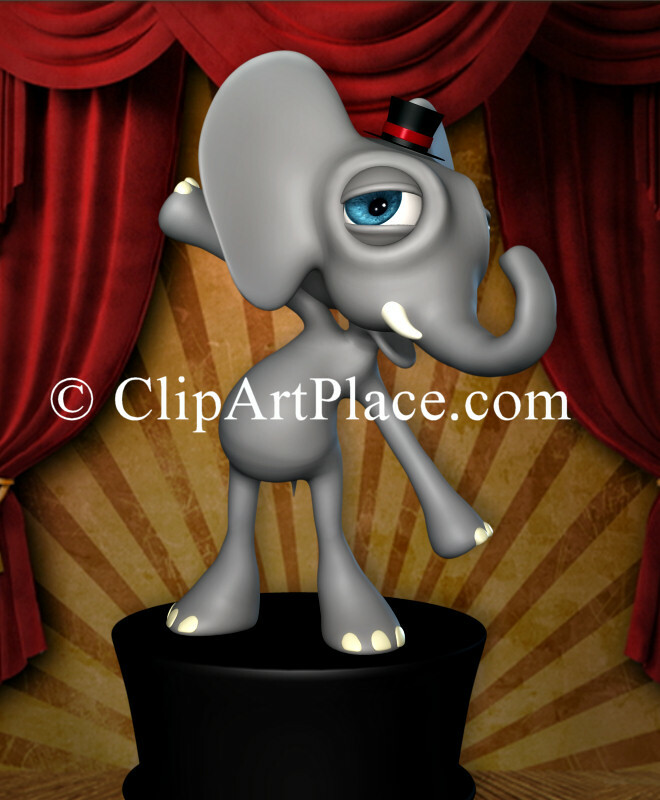 This entry was posted in Thanksgiving Clipart and tagged free graphics, Free Thanksgiving Clipart, Thanksgiving Turkey Menu Graphic, vintage image on November 19, 2014 by ClipArtPlace. 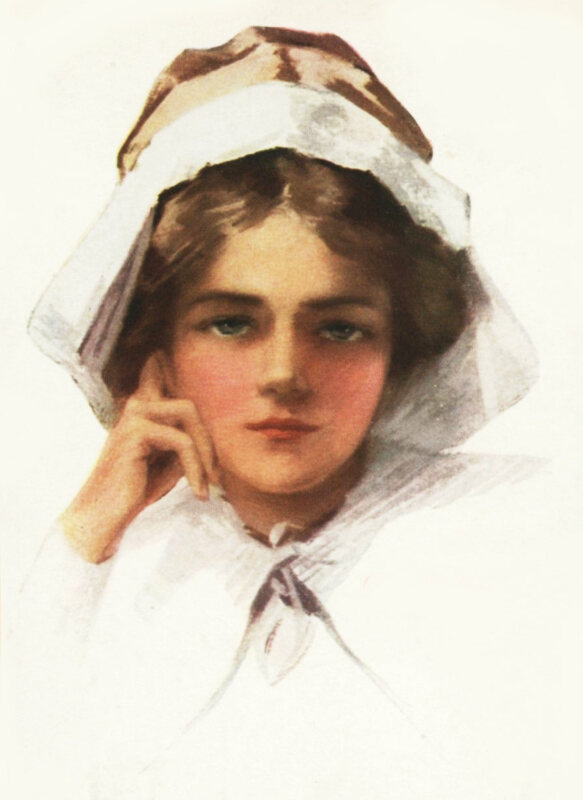 A pretty pilgrim graphic from 1913. This lovely lady is the work of popular Edwardian artist, Philip Boileau. He specialized in creating beautiful images of women. Though born in Canada, Boileau lived in Baltimore for many years, where he painted portraits of fashionable ladies. In 1902, he moved to New York where he met and married Emily Gilbert. Most of his paintings were published between 1905 and 1918 by Reinthal & Newman, New York. Unfortunately, his career was cut short. He died in 1917 from pneumonia. 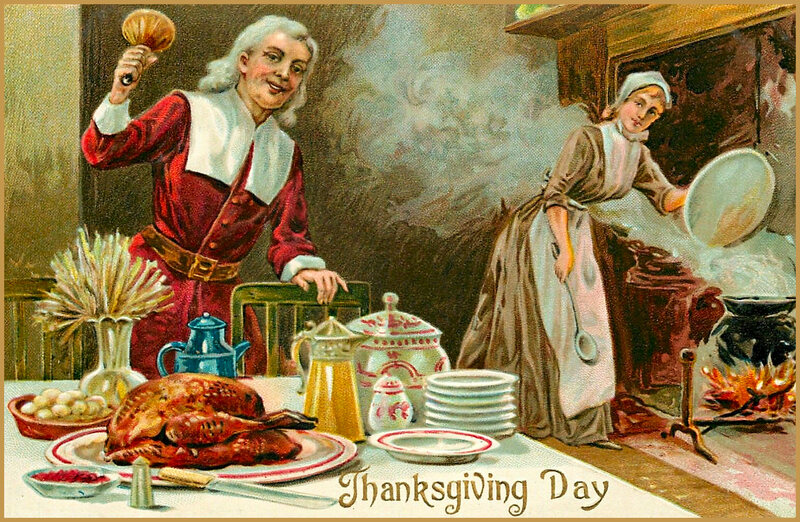 This entry was posted in Thanksgiving Clipart and tagged antique image, Pretty Pilgrim Graphic, Thanksgiving Clipart, vintage image on November 13, 2014 by ClipArtPlace. Thanksgiving Dinner is ready! Or so, it appears in this turn of the century holiday illustration. The male pilgrim is ringing the dinner bell to call everyone to the feast while the female is bent over a boiling pot. The table has a roasted turkey, cranberries, and other holiday goodies. It looks tasty, makes me yearn to join them. I hope you find this image useful for your creations. It was a popular image long ago. 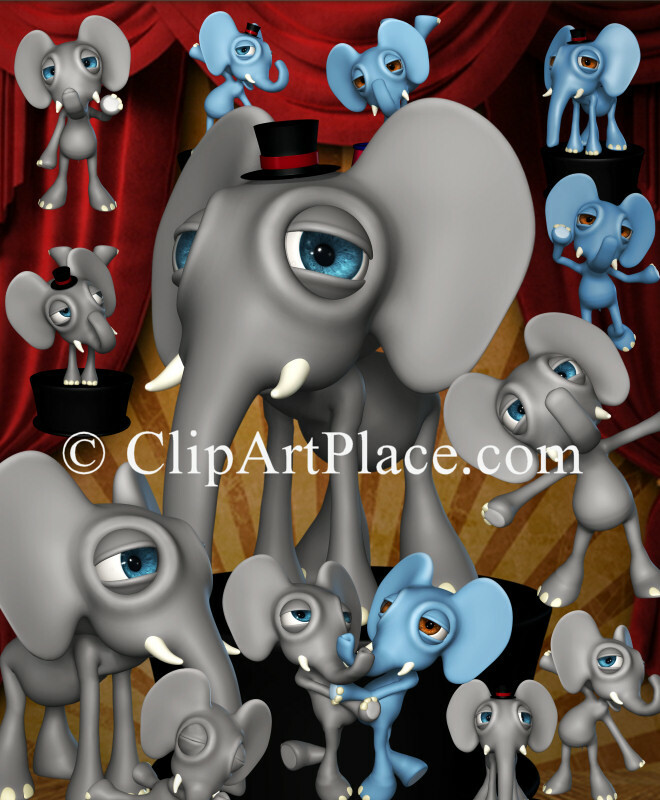 This entry was posted in Thanksgiving Clipart and tagged antique image, free graphics, Thanksgiving Clipart, vintage image, Vintage Thanksgiving Dinner Graphic on November 13, 2014 by ClipArtPlace. A holiday image from the turn of the century, featuring a lovely pilgrim lady making a Thanksgiving pie. I don’t know if it’s apple or pumpkin, but the scene conjures up hunger for both and all of the other great dishes that we associate with the harvest feast. When I visited a local antique store recently, I saw this same vintage image used on a pillow. Someone had transferred the image to a fabric block–there are numerous methods in which to do so–and it looked fabulous. So I can personally attest to at least one project that this image would be great for, and I know there are many others. I hope you find it useful for your digital or DIY craft project. 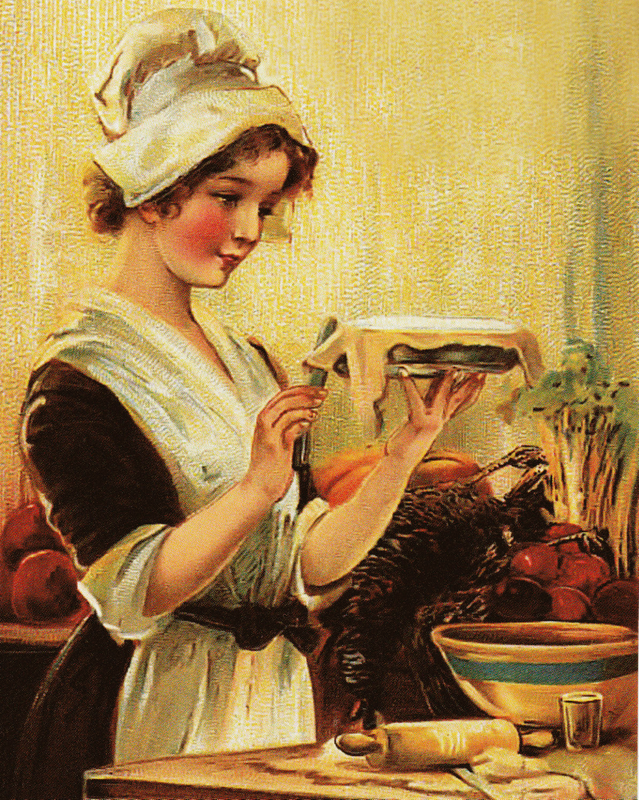 This entry was posted in Thanksgiving Clipart and tagged antique image, Free Thanksgiving Pie Graphic, Thanksgiving Clipart, vintage image on November 13, 2014 by ClipArtPlace. This image was a postcard by Clapsaddle, a popular greeting card artist during the Victorian era, and this particular image was very popular. It’s little wonder as this graphic has such fantastic color and warmth. The flowers in the background, mums perhaps, really liven up what would otherwise be an ordinary table scene. I think this graphic would be great for all kinds of projects, including print and fabric block making. The finished product would be something to treasure just like the original graphic. 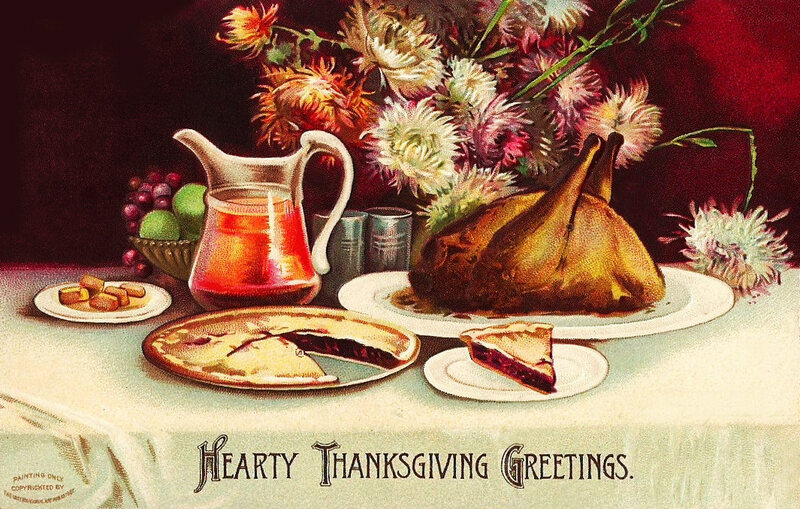 This entry was posted in Thanksgiving Clipart and tagged antique image, Hearty Thanksgiving Graphic, Thanksgiving Clipart, vintage image on November 13, 2014 by ClipArtPlace. A wonderful and rare Thanksgiving illustration from 1912. 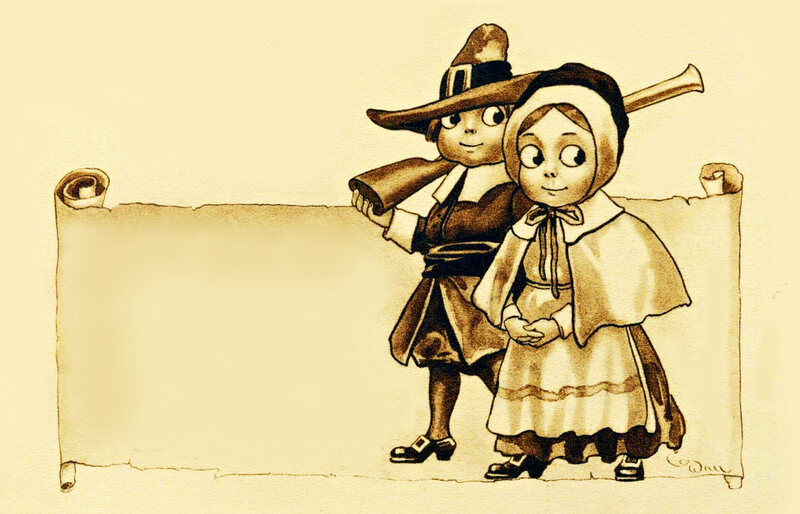 These cute kids are looking sideways at something…perhaps a turkey in the woods. The male has a gun slung over his shoulder. I’ve removed the text from this image so that you can write whatever you wish in the scroll area. This graphic would be great for all kinds of creative projects, but two ideas immediately come to mind–Thanksgiving invitations and/or place setting name cards. Whatever you create, I hope you find a use for this fabulous image. This entry was posted in Thanksgiving Clipart and tagged antique image, Cute Kids Thanksgiving Graphic, Thanksgiving Clipart, vintage image on November 13, 2014 by ClipArtPlace.